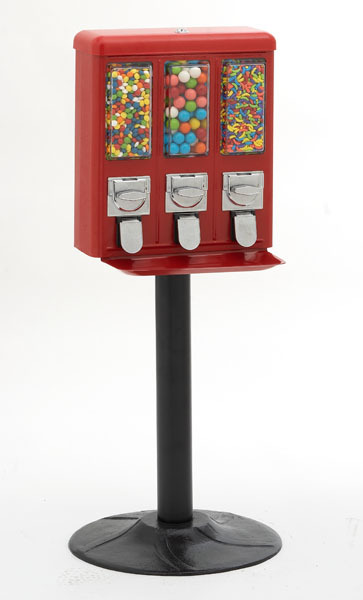 In elegant black and gold, this triple vending machine will add class and variety to any location. All-metal construction for years of trouble free vending. Two outside compartments for small candy and middle compartment for gumballs (all 3 compartments can be set for candy for $15 extra). Preset for quarters. Gold finishes at no extra chargeWe can set this machine to vend for free simply select the "Free Spin" in the option below. Elegant gold or chrome trim. Availability: ships within 24 - 48 hrs.